(Newser) – Arachnophobes, rejoice! 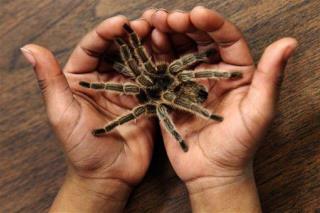 A new study suggests a cure to your fear of spiders is just two minutes away. The only problem is that it involves being near a tarantula. Reporting in Biological Psychiatry, University of Amsterdam scientists say they built an experiment out of the idea of reconsolidation—that memories can be strengthened or weakened when activated, reports Treehugger. Previous research showed a fearful memory could be forgotten if a drug was administered when that memory was activated, per a release. So researchers exposed 45 arachnophobes to a tarantula for two minutes, then gave each a dose of beta blocker propranolol, used to treat high blood pressure and heart conditions, or a placebo. Those given propranolol saw drastically reduced "avoidance behavior" and increased "approach behavior" over the next year. In other words, they were less likely to dodge spiders and more likely to go near one. Propranolol is a popular high blood pressure medicine. The author refers to it as an amnesic drug. Zillions of people are taking it every day. Does this mean that their memories are being modified by it? What are the implications, I wonder? No thanks. I grew up where black widows and brown recluses were common. The only good spider in my house is a dead spider.